Alexander Titz is tackling dangerous hospital bugs head-on. New substances are expected to be effective in destroying the biofilms in which the pathogens thrive, increasing the effectiveness of antibiotics and preventing certain deadly infections. Thin, slimy bacterial cultures grow in the Petri dishes in Alexander Titz’s laboratory. These biofilms are the home of a dangerous pathogen: the Pseudomonas aeruginosa bacterium. It attacks respiratory and urinary tracts or wounds, triggering dangerous infections that can be fatal, in particular, for patients with cystic fibrosis, a genetic disorder. “P. 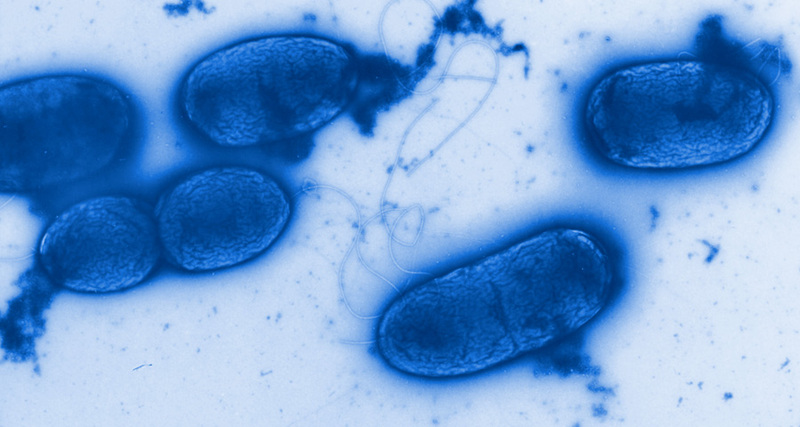 aeruginosa is among the most dangerous hospital bugs,” says Titz, a doctor of chemistry, who has been working at the Saarland field office of the Helmholtz Centre for Infection Research since 2013. With effective antibiotics, the bacteria can be kept reasonably in check for cystic fibrosis patients. “But so far, we have not been able to completely eradicate them,” adds Titz. With his eight-member working group, Titz is rising to this huge challenge. The focus of his work is not so much on new antibiotics but rather on combating these treacherous biofilms. To this end, he is developing agents that act on what are called lectins. These proteins play a crucial role in how the pathogens live together in the biofilm. If the biofilms can be successfully destroyed in this way, Pseudomonas aeruginosa would lose its protective shield, allowing life-saving antibiotics to take effect. Only last year, Titz secured one and a half million euros from the European Research Council (ERC) on the basis of this approach. “This ERC grant is of major importance, and will safeguard our work for the next five years,” says Titz, not without a modicum of pride. The international renown of this compact working group has grown consistently, with numerous publications in prestigious journals, conference invitations, and prominent patents. “There is no lack of promising results,” says Titz. His success in the interdisciplinary field between chemistry, biology, and pharmacy, however, was anything but predestined. He completed his chemistry studies at Technische Universität Darmstadt with a graduate thesis on protein structures, undertaken at the Novartis pharmaceutical company. He worked his way toward biochemistry at the University of Basel with a doctorate on the interaction of carbohydrates and proteins, followed by a two-year post-doc at ETH Zurich, positions which earned him the Klaus Grohe Prize for Medicinal Chemistry. Markus Aebi, his one-time team leader at the Institute of Microbiology at ETH Zurich, says that “Alexander Titz opted to work at the boundaries between chemistry and biology.” This was to have an impact on Titz’s future research. But it was only at the University of Constance that biofilms would become the center of his research. “This interdisciplinary research approach is rife with challenges,” says Markus Aebi with the utmost respect for Titz. “I think it’s wonderful that Alexander Titz is taking on this challenge.” Perhaps Titz’s enthusiasm for biofilms and antibiotic resistances also stems from the interdisciplinarity that gives this research such great impetus. Titz adds, “We need experts in organic chemistry and infectious biology for our research.” And like him, every colleague needs to think beyond the narrow confines of their discipline. Titz and his colleagues in Saarbrücken have been offered a lot to reach their ambitious goals. “This is a world-class institute here. It is very well-equipped, and I have strong support from my colleagues,” emphasizes Titz. “In addition to this, we have the beautiful countryside and the very friendly people of Saarland.” Titz, who has been confined to a wheelchair since a sporting accident nine years ago, enjoys exploring the natural landscape by handcycle. Ihr Kommentar wird nach dem Absenden durch unsere Redaktion geprüft und dann freigegeben, wir bitten um etwas Geduld. Bitte beachten Sie auch unsere Kommentarregeln. Your comment will be checked by our editors after sending and then released, we ask you for a little patience. Do stressed mothers have heavier children? A child may become overweight for various reasons. Researchers at the Helmholtz Centre for Environmental Research (UFZ) in Leipzig have investigated how maternal stress after childbirth plays a role in this. They have now published the results of their study. Interval fasting—does it really live up to the hype? Therapeutic fasting traditionally involves going without food for several days. In the case of intermittent fasting, on the other hand, taking regular breaks from eating is sufficient. But is this approach really effective in terms of the participants’ weight and metabolism? Four scientists from Heidelberg have developed a more reliable method to diagnose prostate cancer and even fight it in a targeted manner. They have now been awarded the Erwin Schrödinger Prize 2018 for their interdisciplinary research. Helmholtz researcher Fabian Theis teaches machines to learn so they can support the work of doctors and scientists. Theis spoke about the benefits offered by big data and machine learning at the Symposium for Individualized Infection Medicine in Hanover, Germany. The cells in our bodies are full of small, circular RNA molecules. Researchers have now discovered that these molecules impact the ways in which we think and learn.